This article was written specifically for Pelaqita Persians © All Rights Reserved. Although toxic ingestion by cats is rare, it is important to understand what common toxins and their effects are. Cats have a unique physiology and therefore handle toxicological emergencies differently than dogs or humans. Cats can become sick from grooming toxins off their bodies or by ingesting (eating) them directly. I would like to discuss the most common toxic agents in cats: Lilies, anti-freeze (ethylene glycol), "over the counter flea medication" (pyrethrins), and Tylenol (acetaminophen). If you suspect your cat has come into contact with any of these substances you should immediately contact your veterinarian. He/she will need to do a physical and neurological exam and possibly blood work to assess your cat's health. The veterinarian will place an IV catheter and start fluids along with other treatments. If your veterinarian suspects that your cat has ingested a toxin, he/she might give your cat medicine to make it vomit, or he/she may perform a gastric lavage (stomach pumping). If the cat has a skin reaction to the toxin, washing him/her in a luke-warm bath with dish soap will help remove the toxins from the skin. Unfortunately, there are no "antidotes" in veterinary medicine for treating toxicity in cats, and therefore other treatments have to be used. 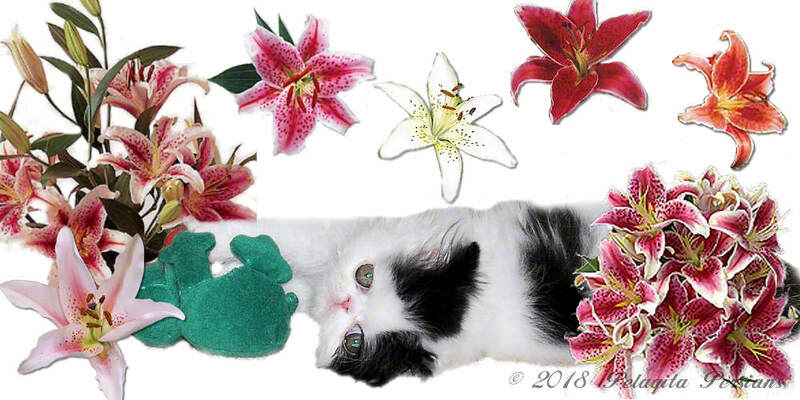 Hundreds of cats have died from eating lily plants. However, not all species of lily plants are toxic, but all should be considered hazardous to cats. Even eating half of a leaf can be deadly for cats. Lily toxicity leads to acute kidney failure. The first signs of lily toxicity are vomiting and loss of appetite/not eating. These usually occur within the first two hours after eating the plant. Within 24-96 hours of ingestion, kidney failure will develop. It is very important that if your cat eats lily that you immediately bring him/her to vet. If treatment is started early and carried out successfully the prognosis is good. If the cat begins to have kidney failure, the prognosis is grave. Antifreeze (ethylene glycol) poisonings is fatal to cats, and the lethal dose is a third of what it would be for a dog. For cats, antifreeze tastes very sweet but it can lead to death very quickly. Within two hours of ingestion, the cat will look "drunk" and may drink lots of water, much more than would be typical for him/her. Within 12 hours, cats will begin to have kidney failure along with vomiting and diarrhea. After 24 hours the kidneys no longer produce urine and the cat will die. Although there are no reliable tests to detect antifreeze poising, a diagnosis can be made by urine analysis and blood work. Even with early treatment and aggressive therapy the prognosis for survival is still less than 30%. So it is very important to keep antifreeze in places that cats (and other animals) can not access and check your vehicles for antifreeze leaks. Over the counter (OTC) flea and tick medications, which contain pyrethrins, and pyrthroids are toxic to cats in very small doses. Hertz is the largest manufacture of these OTC treatments and veterinarians do not recommend them for cats or dogs because of their small margin of safety and are infective for treating fleas. Pyrethrins are natural occurring substances from the Chrysanthemum bush that are toxic to cats. Cats usually experience toxicity when a "dog only" product was used on a dog that had close contact with a cat or a "dog only" product is used directly on cats. Even some OTC cat products are harmful to cats, only flea medication purchased from a veterinarian should be used on cats or dogs. Signs that a cat has been exposed include head tremors, muscle twitches, drooling and seizures. Mildly affected cases with early aggressive management and continuous supportive care have good survival rates, but prolonged seizure activity may cause brain damage and death. Your veterinarian can provide you with the right flea product for your cats and dogs. Tylenol (acetaminophen) toxicity usually occurs when a well meaning owner gives this medication to his/her cat for pain relief. Cats can't fully metabolize acetaminophen, so their bodies produce toxic metabolites. The toxic metabolites cause damage to the red blood cells which leads to decreased oxygen levels and death. Between 24 and 72 hours cats will develop facial and forelimb swelling (edema) along with chocolate colored mucous membranes. These cases are challenging because cats have unique livers and the vulnerability to the toxin is variable. It is very important to use only veterinarian prescribed pain medications as your veterinarian will provide you with the safest pain medication for your cat. In summery, cats have unique systems that respond to substances in different ways than other pets. They require specific and aggressive treatment when they have been exposed to toxins, many of which are common household items. If you suspect that your cat has been exposed to anything that might be harmful, it is important to seek proper veterinary care immediately to ensure that your pet has the best chance at recovery.